CiviCRM's features include allowing your constituents to create their own fundraising pages - and then ask others to fund their cause. These pages are called Personal Campaign Pages or "PCPs". A personal campaign page allows your constituents to personalize the fundraiser, event, organization, etc., by offering their personal reasons and/or experiences with the organization on their own personal page. Also, your contributors may in turn send the personal campaign pages to their circle of friends. You can enable the "tell a friend" feature to help someone share their page even more. Examples of this feature in action are typically called "Sponsor My 5k Walk", "Help Fund Our Trip" or "Let's Raise Money to Build A School". CiviCRM's PCP functionality doesn't allow for team management. For instance, a fundraising leader recruiting members to a team, managing membership and then keeping track of which member brought in how much money is not supported by CiviCRM at this time. There is a limit of a single image uploaded to a PCP by the fundraiser. The image is not automatically re-sized. The thermometer and honor roll appearance can be modified, but changes are applied to all pages. These customizations cannot be done without the expertise of a coder. Approval Required: check this option to moderate all PCP creation requests. An administrator must approve the page before it becomes active, at which point the user will be notified via email, and may proceed to promote it (ensure "notify email" is also used to notify an administrator when PCP pages are awaiting review). Notification Email: Each time a new PCP is created, an email will be sent to the named administrators (separate multiple email addresses with commas). Supporter Profile: select a profile of fields to be collected from the user creating the PCP. Owner Email Notification: an email can be automatically sent to the PCP owner whenever a donation is made through their page. You can select whether emails will always or never be sent automatically for all PCP pages created under that particular event or contribution page. Alternatively, you can allow the PCP owner to choose during the page set up process whether or not they would like to receive notification of donations made through their page. Allow 'tell a friend' functionality: the PCP owner may send emails to their contacts, encouraging them to visit their page and contribute. 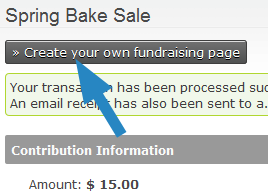 Campaign Type: when enabling PCPs for an event, you may give the event registrant the option to either create a fundraising event of their own, or a contribution page (e.g. to raise money in support of their attendance). An individual donating to a contribution page or registering for an event is given the option to build their own PCP via a button on the 'thank you' page. *CONTRIBUTION_OR_EVENT_ID*: give the ID number of the event or contribution page. This can be obtained through navigating to 'Manage Events' or 'Manage Contribution Pages' and looking for the ID against the item in question. *EVENT_OR_CONTRIBUTE*: If the invitation is for a Personal Campaign Page in support of a contribution page, use component=contribute. If the invitation is in support of an event, use component=event. When an individual has clicked the 'create your own fundraising page' button or a direct link, they will be presented with a form to fill out their information, including: a title, message, monetary goal amount and text for the donate button. They may also attach a photo, enable a progress - thermometer style - bar, include an honor role of their donors who have not elected to be anonymous, and whether the campaign is active (they may choose to activate it at a later time). If PCP moderation has been enabled (the 'approval required' option), an administrator must log into the CiviCRM back-end and enable the page at Contributions > Personal Campaign Pages before the individual is able to use it. Simply seek the PCP in the list, look toward the end of the row and click 'Approve', 'Reject' or 'Delete' (at a later date, you may also enable/disable the PCP by clicking the 'More' link). The individual will be sent a confirmation email, and may proceed to use it. Ensure administrators are always alerted to this step by entering a notification email address in the contribution page settings (see 'Set-up' above). Finally, following approval the PCP owner will be sent an email outlining how they may begin promoting their page and editing it, providing they have been given user access. The user and administrator can edit the PCP settings at any time through the menu item: Contributions > Personal Campaign Pages> click Edit, Delete or Disable/Enable.